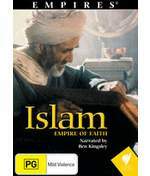 This impressive documentary continues with the “Empires” theme and is narrated by Ben Kingsley with three amazingly in-depth episodes that give the viewer a truly unique insight into Islam itself. Not only does it serve as a religious documentary, it delivers on the culture and how they influenced not only the ancient world but also the modern world. The DVD collects all three episodes from this series and will truly give you a unique and new insight into this amazing culture that has unfortunately been stereotypically incorrectly labelled. The culture of Islam even created a wide variety of devices in ancient times from their medicine to science that went hand in hand with their religion. It also highlights how Islam has spread across the world and for those who wish to have an accurate and unique insight into this culture, than this is the DVD for you. Very insightful and highly recommended! This crushes many stereotypes of this religion and culture.